The good news first: Baabul, which has been rejected in India, has emerged a big hit in U.K. and U.S.A. In fact, at the close of the weekend on 31st December, 2006, the film stood at No. 5 position amongst Bollywood releases in 2006, overtaking biggies such as Krrish, Lage Raho Munnabhai and Rang De Basanti in U.K. In the U.S. too, the film has crossed $ 1 million, which says it all. Now, the all-important news! According to a report on an important American website, as many as eight Hindi films feature in the Top 15 foreign language films of 2006 in America. The Hindi films that feature in the coveted list include Water [No. 6 on this list; $ 3.3 million], Kabhi Alvida Naa Kehna [No. 7; $ 3.3 million], Dhoom 2 [No. 10; $ 2.6 million], DON [No. 11; $ 2.2 million], Lage Raho Munnabhai [No. 12; $ 2.2 million], Rang De Basanti [No. 13; $ 2.2 million], Fanaa [No. 14; $ 2.1 million] and Krrish [No. 15; $ 1.8 million]. The above-mentioned report clearly indicates that Overseas is the No. 1 territory as on this date and the business is indeed booming. So the next time anyone tells you that the Overseas market is in dumps, you know what to answer! Meanwhile, Bhagam Bhag, the last biggie of 2006, is faring well in the two major markets -- U.K. and U.S.A.
Now the bad news: The final release of 2006, I See You, has been rejected outside India as well. The film has proved a non-starter in U.K., fetching a dull start in its opening weekend. Bhagam Bhag [this weekend: No. 13]: In its second weekend, the film has collected "£ 121,775 on 45 screens, with the per screen average working out to "£ 2,706. Total: "£ 377,388 [approx. Rs. 3.29 crores]. Baabul [this weekend: No. 17]: In its fourth weekend, the film has collected "£ 49,909 on 23 screens, with the per screen average working out to "£ 2,170. Total: "£ 875,750 [approx. Rs. 7.63 crores]. I See You has debuted at No. 24 position. In its opening weekend, the film has collected "£ 11,682 [approx. Rs. 10.18 lacs] on 13 screens, with the per screen average working out to "£ 899. Dhoom 2 [this weekend: No. 32]: In its sixth weekend, the film has collected "£ 7,334 on 5 screens, with the per screen average working out to "£ 1,467. Total: "£ 1,162,370 [approx. Rs. 10.13 crores]. Kabul Express [this weekend: No. 34]: In its third weekend, the film has collected "£ 5,847 on 7 screens, with the per screen average working out to "£ 835. Total: "£ 104,941 [approx. Rs. 91.41 lacs]. Thiruvilayadal Arambam [Tamil; this weekend: No. 41]: In its second weekend, the film has collected "£ 3,183 on 2 screens, with the per screen average working out to "£ 1,592. Total: "£ 15,622 [approx. Rs. 13.61 lacs]. Bhagam Bhag [this weekend: No. 34]: In its second weekend, the film has collected $ 180,805 on 51 screens, with the per screen average working out to $ 3,545. Total: $ 695,583 [approx. Rs. 3.08 crores]. Dhoom 2 [this weekend: No. 45]: In its sixth weekend, the film has collected $ 52,904 on 16 screens, with the per screen average working out to $ 3,307. Total: $ 2,621,407 [approx. Rs. 11.62 crores]. Kabul Express [this weekend: No. 54]: In its third weekend, the film has collected $ 25,574 on 20 screens, with the per screen average working out to $ 1,279. Total: $ 281,272 [approx. Rs. 1.25 crores]. Baabul: The film has grossed $ 1,027,164 in the North American territory [till 31st Dec.]. The break-up: U.S.A. gross $ 745,019, Canada $ 282,145. 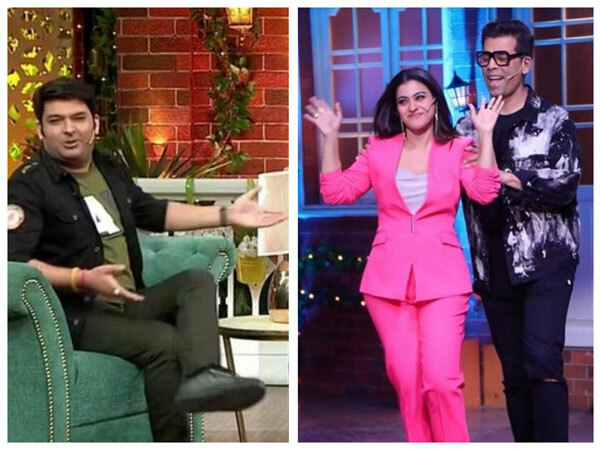 The Kapil Sharma Show: Kajol & Karan Johar Appear; Was Kapil Trying To Woo KJo To Come On His Show?